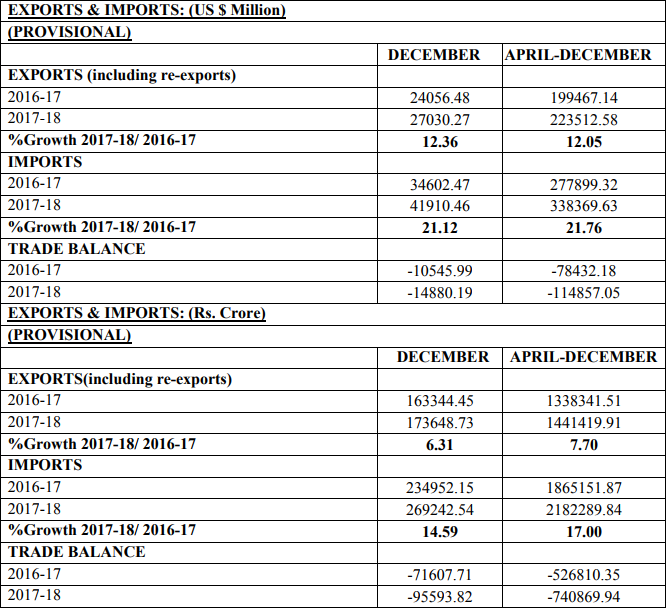 Exports during December 2017 have exhibited positive growth of 12.36 per cent in dollar terms vis-à-vis December 2016. Exports have been on a positive trajectory since August 2016 to December 2017 with a dip of 1.1 per cent in the month of October 2017. Exports during December 2017 valued at US $ 27030.27 million as compared to US $ 24056.48 million during December, 2016. In Rupee terms, exports were valued at Rs. 173648.73 crore as compared to Rs. 163344.45 crore during December, 2016, registering a rise of 6.31 per cent. During December 2017, Major commodity groups of export showing positive growth over the corresponding month of last year are Engineering Goods (25.32%), Petroleum Products (25.15%), Gems & Jewellery (2.38%), Organic & Inorganic Chemicals (31.36%), and Drugs & Pharmaceuticals (6.95%). Cumulative value of exports for the period April-December 2017-18 was US $ 223512.58 million (Rs 1441419.91 crore) as against US $ 199467.14 million (Rs 1338341.51 crore) registering a positive growth of 12.05 per cent in Dollar terms and 7.70 per cent in Rupee terms over the same period last year. Non-petroleum and Non Gems & Jewellery exports in December 2017 were valued at US $ 20186.36 million as against US $ 18013.78 million in December 2016, an increase of 12.06%. Non-petroleum and Non Gems and Jewellery exports during April -December 2017-18 were valued at US $ 163714.94 million as compared to US $ 144674.52 million for the corresponding period in 2016-17, an increase of 13.16%. Imports during December 2017 were valued at US $ 41910.46 million (Rs 269242.54 crore) which was 21.12 per cent higher in Dollar terms and 14.59 per cent higher in Rupee terms over the level of imports valued at US $ 34602.47 million (Rs. 234952.15 crore) in December, 2016. Cumulative value of imports for the period April-December 2017-18 was US $ 338369.63 million (Rs. 2182289.84 crore) as against US $ 277899.32 million (Rs. 1865151.87 crore) registering a positive growth of 21.76 per cent in Dollar terms and 17.00 per cent in Rupee terms over the same period last year. Major commodity groups of import showing high growth in December 2017 over the corresponding month of last year are Petroleum, Crude & products (34.94%), Electronic goods (19.2%), Pearls, precious & Semi-precious stones (93.98%), Gold (71.52%), and Machinery, electrical & non-electrical (11.21%). Oil imports during December, 2017 were valued at US $ 10345.88 million which was 34.94 percent higher than oil imports valued at US $ 7667.01 million in December 2016. Oil imports during April-December, 2017-18 were valued at US $ 76148.85 million which was 24.18 per cent higher than the oil imports of US $ 61319.72 million in the corresponding period last year. In this connection it is mentioned that the global Brent prices ($/bbl) have increased by 18.75 % in December 2017 vis-à-vis December 2016 as per World Bank commodity price data (The pink sheet). Non-oil imports during December, 2017 were estimated at US $ 31564.58 million which was 17.19 per cent higher than non-oil imports of US $ 26935.46 million in December, 2016. Non-oil imports during April-December 2017-18 were valued at US $ 262220.78 million which was 21.07 per cent higher than the level of such imports valued at US $ 216579.60 million in April-December, 2016-17. Exports during November 2017 were valued at US $ 15,392 million (Rs. 99836.51 Crore) registering a positive growth of 8.76 per cent in dollar terms as compared to positive growth of 3.06 per cent during October 2017 (as per RBI’s Press Release for the respective months). Imports during November 2017 were valued at US $ 9,647 million (Rs. 62572.95 Crore) registering a positive growth of 10.89 per cent in dollar terms as compared to positive growth of 2.96 per cent during October 2017 (as per RBI’s Press Release for the respective months). MERCHANDISE: The trade deficit for December 2017 was estimated at US $ 14880.19 million as against the deficit of US $ 10545.99 million during December 2016. SERVICES: As per RBI’s Press Release dated 15th January 2018, the trade balance in Services (i.e. 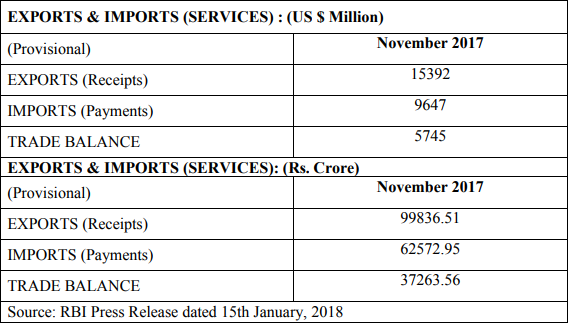 net export of Services) for November, 2017 was estimated at US $ 5,745 million.